The last few weeks we have been talking and doing activities about oceans. Singing is a wonderful way to involve all children, especially English learners, in learning. Enjoy singing this song! It's always important for our children to learn about good role models. We especially like to share examples of careers that children may not readily see. Last week we talked about our oceans and their essential role to life on Planet Earth. Many children do not always have the chance to think about those who study our oceans and help protect them. This is a topic near and dear to my heart as my husband was an early researcher studying the impacts of plastic pollution in our ocean waters. Share stories of people like Sylvia Earle who was a pioneer in living underwater in a specially constructed "home." This helped scientists live beneath the surface of the ocean for weeks at a time. Imagine what these scientists could see! This is exactly what you can invite your children to consider. Show photographs of the ocean. Talk about the darkness in the deep parts of an ocean. Imagine what it might be like to try and learn about fish and plants that stay in these deep waters. We suggest beginning sentences with "I wonder..." to have a grand conversation. Marie Tharp is another female scientist who contributed to what we know about oceans. She used the mathematical information from naval ships to map the floor of the ocean. It was her work that showed the world that the ocean had hills, valleys, and ridges. She found a large ridge we call the "backbone of the earth." Today her maps hang in the offices of many scientists. After telling the brief story of Marie Tharp, ask your children to wonder what a map of the ocean floor might look like. Ask them to draw their own maps. You can use this activity to discuss perspective. Do children draw their maps so they are looking down at the floor of the ocean? Katy Payne* listened carefully to the sounds that whales make. She used special tools to record these underwater sounds. She even made pictures showing what whale songs look like. Then she found out that whales can change their songs and other whales learn the new songs! Ask your children to wonder what whale songs might sound like. Have children sing possible whale songs to each other. Then play actual whale songs so children can check their guesses. You can hear whale songs from Katy Payne here. *Next week, our activity packet will feature Katy Payne. Be sure you are signed up to receive these. Just add your email in the yellow box above. As we highlight the accomplishments of women in March, we thought it would be fun to take a look at our oceans, where so many female scientists have done amazing work. But before talking about these women*, begin by introducing your children to what an ocean is and how it can be studied. In this lesson, you can emphasize concepts such as weather, transportation, and special clothing, which are a natural part of the curriculum for young learners. First show your class a globe. Spin it around and show children that oceans make up a lot of our world. Ask children to point out all the water on the globe. Realizing that the oceans are colored blue helps them to develop an understanding of how to use text features in the future. Explain to children that today you will be finding out more about oceans, their water, and what lives in them. Show children several pictures of different ocean scenes (easily available on the Internet). These should include: the Arctic as this is a good example of cold water, a warm ocean area near the equator, and a picture of a storm on an ocean. Hold a “grand conversation” about the many differences they can observe about oceans. Next talk about the type of water that is found in oceans. Show two containers of water and a container of salt. Put the salt into one container and stir it. Explain that ocean water is salty. Ask children to ‘turn and talk’ in response to the question: Can people drink ocean water? Ask children to imagine what this might taste like. Some children who have been swimming in an ocean might share their experiences. Then talk about people who study oceans. Show pictures of a submarine and boats. Discuss how these can be used as transportation to help scientists reach places in the ocean they need/want to learn more about. Discuss the special equipment a scientist needs to wear when swimming in the ocean. Show pictures of scuba divers. 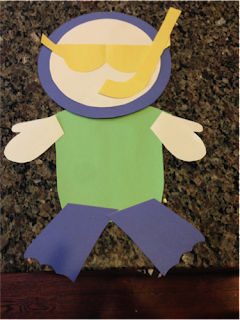 Finally, have children make their own depiction of a scuba diver. You can pre-cut materials as shown below so children can create a scientist who learns more about the ocean habitat. You can even encourage them to make up a story about what their scientist discovered about an area of the ocean. NAEYC – 2.G. & 2.J.05. Head Start – III.C.1 & 3., XI.B.1. *Next week we will share some female oceanographers.